My career as a penny-stock equity analyst gives a unique perspective to the issuer. HMNY is insolvent and the likelihood of bankruptcy is very high. Management never cared about a viable business model. Even today’s kinder, gentler SEC is likely to investigate the company. It’s almost certain shares will be delisted from NASDAQ. HMNY has several corporate attributes of a penny-stock company, and may be a “pump & dump” scheme. 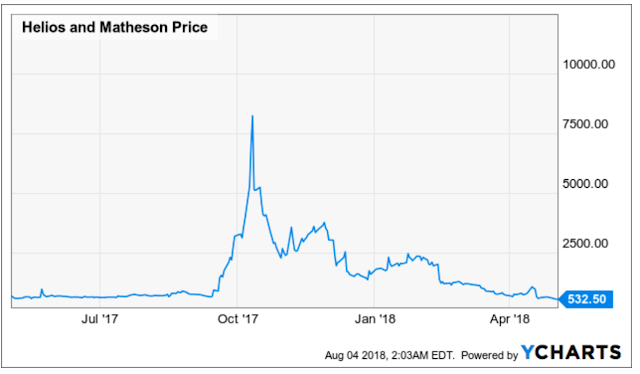 My friends, Helios and Matheson (NASDAQ:HMNY) reminds me of those days though the company may not be part of a calculated pump & dump scheme. As a reminder, HMNY is the 92% owner of MoviePass, having initially invested $27MM in August 2017 (for a total sum of $72MM as of Dec 2017). I was introduced to MoviePass last fall when my sister-in-law ranted & raved that it was the greatest thing since sliced bread (just $10/month). My dollar-wise wife surprised me by purchasing an annual contract, which further reduced the cost to $7/month. I recently pored through several critical Seeking Alpha articles; most authors have calculated how unprofitable the business model is. It usually goes something like this: HMNY pays full price for tickets but its MoviePass customers (depending on how many times they go to the theater) pay less, so HMNY is losing money. My response to you is – not all management is stupid. HMNY’s management team can clearly see that losses are rising as subscribers grow. If the business model made them the next Netflix, so be it. But that may not have been their intention. Management and insiders benefited when their shares (received through stock awards) rose or from company fees given to them. The Netflix shtickwas the story that MoviePass CEO Mitch Lowe was hoping could elevate HMNY’s share price. 1. Small Size: HMNY’s revenues were just $10.4MM in FY’17, according to the Annual Report. 2. Name changes: There have been several name changes of related entities. Helios and Matheson Analytics (aka “HMNY”), the subject of this article, was originally called “A Consulting Team” (and publicly traded on the NASDAQ). It changed its name to Helios and Matheson North America in 2007. Its name was changed to Helios and Matheson Technology Inc. in 2011. In 2013, it changed its name to the current Helios and Matheson Analytics. Note that during 2011 and 2012, the company’s name was identical to that of its Indian parent – Helios and Matheson Technology Inc. (HMIT) Confused? 3. HMNY is controlled by dubious insiders: Its parent company, HMIT controlled approximately 75% of HMNY until November 2016 when HMNY merged with Zone Technologies (controlled by then CEO Ted Farnsworth). After the merger, Farnsworth and HMIT owned 59% of HMNY. According to Bloomberg, Farnsworth was involved with penny stocks – three companies he led had shares decline 99% despite his (overly) ambitious plans. MoviePass CEO Mitch Lowe also has penny-stock experience as a director of Medbox, which was sued for fraud by the SEC in 2016. There is also a controversy of whether Lowe overstated his experience as a “cofounder” of Netflix according to The Street Sweeper. I examined Netflix’s initial Form S-1 filed on April 2000 (really bad timing!) and while Lowe is not listed as one of the two cofounders, he was an executive at the company. HMNY’s former chief technology officer, Parthasarathy Krishnan (who received large stock awards) was also an executive of HMIT and is also on the receiving end of the Indian court order according to Business Insider. Lastly, note that HMIT holds a $2MM security deposit for unused services to HMNY, of which it’s likely not to receive given the court order (source 10-k). 4. Late filings: HMNY filed its Form 10-K for 2017 late. The 10-K for 2015 was amended to note that the proxy statement would be filed late. 5. Transactions with related entities: As already mentioned, HMNY has conducted transactions with HMIT including consulting and other fees to controlling shareholders of HMIT. 7. Misleading statements:. HMNY’s CEO Ted Farnsworth stated to Variety magazine during a May 2018 interview at Cannes that the company has an equity line of credit, alluding to what is more commonly called a committed Revolver. That is untrue, as I have not seen evidence in the quarterly or annual reports sent to the SEC. The SEC requires that all forms of liquidity, including both internal and external, be disclosed. The SEC rule can be found here. Farnsworth is also on the record saying that HMNY would be worth $1 billion once it reaches 2.5 million subscribers. As of this writing, Moviepass has over 3 million subs and its market cap is under $1 million. On April 2018, HMNY said it would get into the film studio business and acquired a stake in the John Gotti film (awful movie by the way). Besides lacking the funding to get into the craft of making films, the business rational was that MoviePass can “guarantee box office attendance”- Really?! 8. Weak accounting and governance (AGR): HMNY’s very own annual report for 2017 states that “Management has determined that the Company did not maintain effective internal control over financial reporting as of the period ended December 31, 2017 due to the existence of the following material weakness identified by management: Lack of Accounting Resources.” Further, the AGR research firm MSCI GMI Analyst rates the company “1”, its worst score. HMNY is not audited by a Big 4 accounting firm. Its auditor is Rosenberg Rich Baker Berman, P.A. Investors should avoid HMNY shares like a bad movie. The company recently took out a payday-like loan ($5 million) from a hedge fund that was repaid on August 5th 2018. The loan was necessary to “keep the lights on” as one would say. The company also has a $1.2Bn shelf offering filed with the SEC. While this article is not focused on HMNY’s accounting, do note that HMNY is bleeding cash. The company has just$14MM in unrestricted cash and reports $42.5MM on its balance sheet as of March 2018 (see table). The point of this article wasn’t to debate HMNY’s business model or do a forensic accounting of financial shenanigans. Given my background in penny stocks, I wanted to show you how to avoid shoddy investments by using a qualitative common sense approach. Even if life-saving financing miraculously appears, an SEC investigation will likely ensue given the company’s shady history and misleading statements. Why bother with such nonsense when they’re many good fish in the Sea?